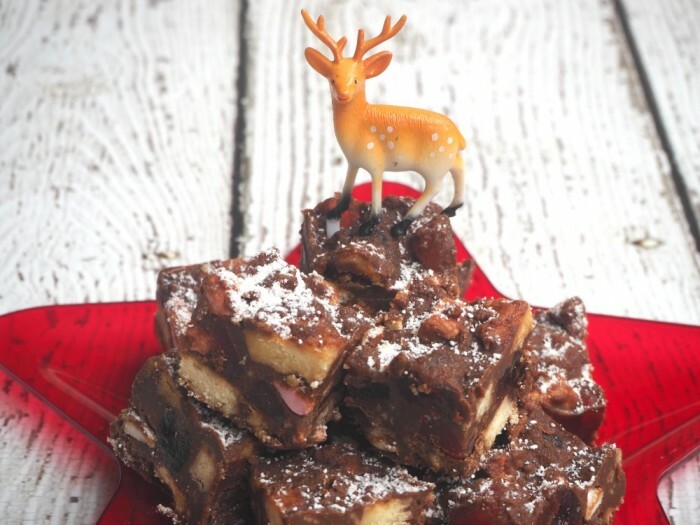 It’s the value added butter and golden syrup that makes this Rocky Road, so naughty, but so nice! Tracey tweaked this Nigella recipe to make it her own, and then I tweaked it to too. This recipe comes to you from three different kitchens – that makes it thrice as nice! Lightly brush a 30cm x 25cm shallow tray with water and then line with baking paper, making sure the paper extends over the long sides. Break up both sorts of chocolate into small pieces, or you can use chocolate melts instead. Put the chocolate into a heavy-based pan to melt with the butter and syrup over a gentle heat. Put the biscuits into a freezer bag and bash them with a rolling pin to get big and little sized crumbs. You want some big crunchy pieces and some sandy bits too. Take the pan off the heat, add the crushed biscuits, whole glace cherries, halved raspberry sweets and mini marshmallows. Turn carefully to coat everything with the syrupy chocolate. Tip into prepared tray, smoothing the top as best you can, don’t worry it’s supposed to look bumpy, it is Rocky Road after all! Refrigerate until firm enough to cut, which will take at least 1 ½ – 2 hours. Then take the set block of Rocky Road out of the tray ready to cut. Push the icing sugar through a small sieve to dust the top of the Rocky Road. With the long side in front of you, cut into it 6 slices down and 4 across, so that you have 24 very sumptuous squares. MAKE AHEAD TIP! 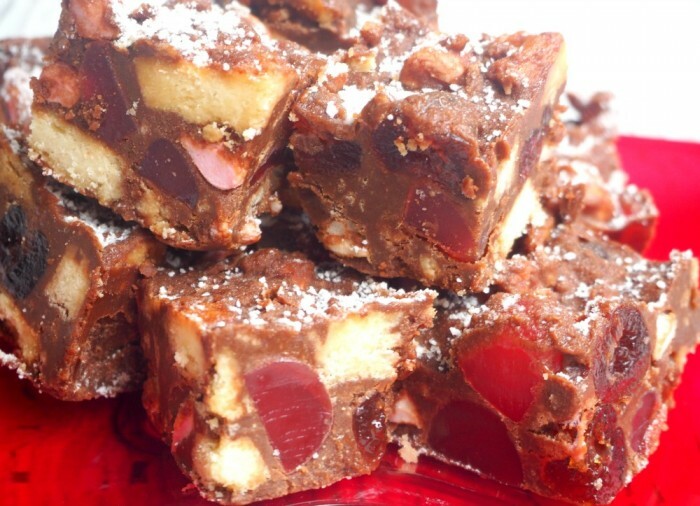 Make the Rocky Road and refrigerate to set. I like to cut into bars, store in an airtight container in a cool place for up to 1 week and then decorate with icing sugar about 1-2 hours before serving. FREEZE AHEAD TIP! 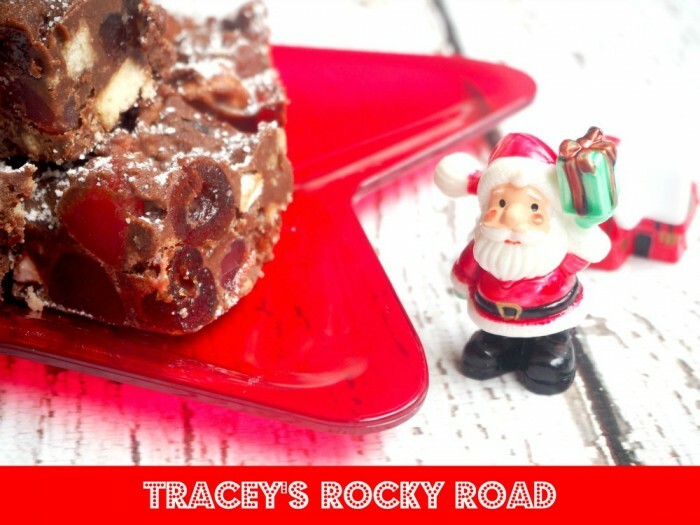 Make the Rocky Road as above and freeze for up to 1 month. Thaw overnight in a cool place. Decorate as above.